The 2019 Scholarship Application is now available for any female student entering her junior or senior year of undergraduate school or entering or enrolled in a graduate program at an accredited college or university based in New England. The student must demonstrate an interest in pursuing a career in the commercial real estate industry through her course studies and/or internships in a commercial real estate firm. The 2019 Scholarship, that will be awarded in May 2019, is expected to be at least one $10,000. The deadline to apply for the 2019 Scholarship is February 28, 2019. To learn more about the CREW Network Scholarship, click here. From Christine Flaherty, 2018-2019 President of the CREW Boston Educational Foundation, Inc.
Once again, we were very fortunate to have a strong group of candidates for the Educational Foundation annual scholarship from both undergraduate and graduate colleges and universities throughout New England. This year, thanks to the support we have received, we were able to award one $10,000 scholarship. The CREW Boston Educational Foundation Scholarship recipient has shown us that she have an amazing work ethic and drive to succeed. She is an exceptionally bright young woman, and we look forward to watching her grow within the commercial real estate industry. 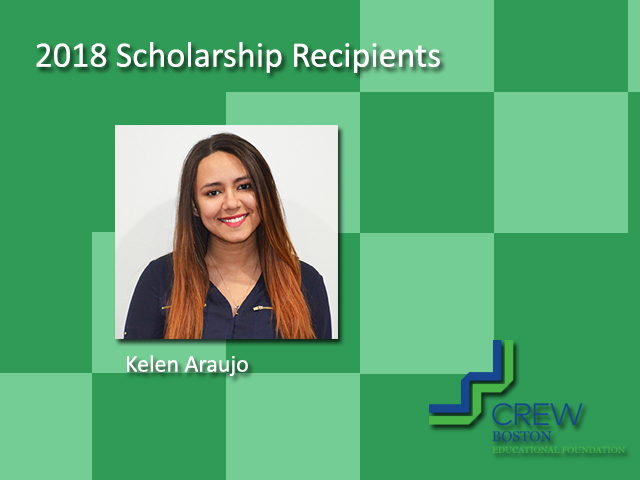 We are thrilled to award the 2018 CREW Boston Educational Foundation scholarships to Kelen Araujo.